It’s been a brilliant and enjoyable week. As any regular readers will know, one of my constant themes is that the voluntary sector needs to link more closely with businesses and corporates, and vice versa, to fill the gap caused by the (irreversible) decline in central and local government spending. Well, Monday evening saw the launch of our “4x4 Project” whereby in collaboration with Surrey Chambers we have tried to link four businesses to four of our member organisations. The evening was hosted by The Co-operative Bank, and was a very good start to the development of wider links to business. Specific follow up actions are happening, and particular thanks to PKF, who have been brilliant. I then met with someone from BiS to carry on the discussion, and on Wednesday with two managers from Business in the Community (BitC). One is running the national programme called “United Futures” encouraging “top down” links between corporates and youth organisations. 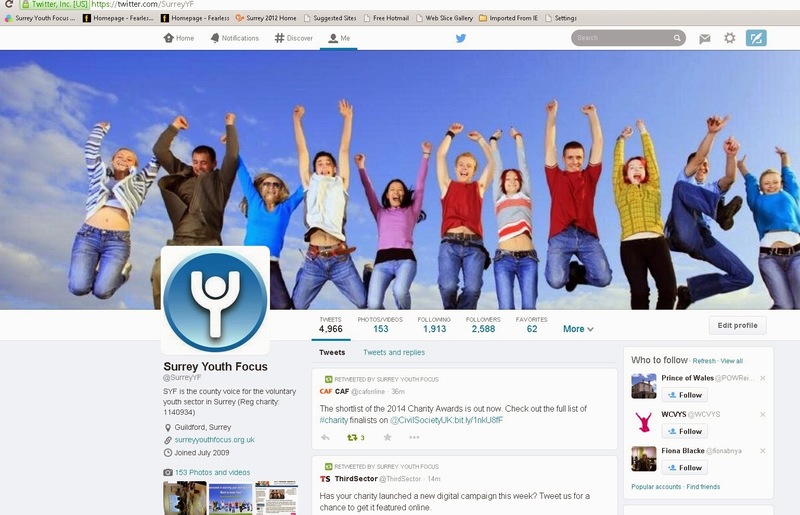 It is a collaboration between the DfE, UK Youth, National Childrens Bureau and our own national umbrella body the National Council for Voluntary Youth Services, and her colleague has responsibility for Surrey/Sussex. It was a really positive meeting, and again follow up action happening. So we have both top down, and bottom up approaches. Yesterday I was privileged to be introduced to the CEO of Surrey Satellite Technology and be shown round the massively impressive site. The possibility of links between SST and specific member organisations was discussed. One telling point made to me was that competition (for contracts) was a fact of life, and that the voluntary sector needs to get much better at defining income streams (selling goods and services) rather than looking for government grants. There are of course voluntary organisations (Scouts, Guides) who have eschewed grants/contracts and have a different business model, but the point was well made….I am brewing up a Lottery bid…more later. A quietish week in consequence of half–term I guess. Interesting series of three articles in Third Sector by John Tizard on the “anger, helplessness, and deep frustration” shared with him by top charity chief execs “...it is clear that the attitude and behaviour of public sector policy makers, commissioners and procurers are exacerbating the situation that they find themselves in and creating really serious problems.” I hear that Surrey CC staff are claiming credit for Surrey Community Action’s successful Transforming Local Infrastructure bid…I am (almost) speechless. John Tizard’s advice to chief execs is (as ever) to go where the energy is, and seek out opportunities. SO, with that in mind I had a useful all day meeting of the South East Youth Partnership (SEYP) on Tuesday and heard about how other local authorities in the SE are simply transferring youth centres to be managed by local organisations (Bucks, West Sussex ) and their NEET figures are also going down. I met with our sports organisations on Wednesday evening at the Riverside Centre in Guildford – the base of the Wey Kayak Club that has 4 members of the GB Olympic Team, and over 450 members, and 50 coaches. Very impressive, and the voluntary sector at its best. Thursday was a training day here with a skilled trainer from NCVO taking us through the Valuing Infrastructure Programme, and although I think it’s quite complex, it does have real application for us, and indeed I’ll be using it for a forthcoming awayday with Trustees. I had seen it before, and have already used it in a modified form to structure our service offer to members, and we now have the highest number of members ever! An odd week, partly because I've taken 2 days off to work on my MA Theology, so I have moved from the highly cerebral, not to say ethereal, to the practical. So practical, that on Monday we had an office clear out / de-cluttering day, which we do every year to avoid the geological layers of files and unread, but “must keep” papers. My more fundamental concern is that we seem to be getting to a point of stasis – where competing pressures cancel out, resulting in us all standing still, or in an alternative metaphor the blood circulating around the body politic more slowly. “The Big Society” seems moribund and no longer the subject of much public comment, whilst there is a risk of localism being overpowered by commissioning which leaves power strongly in the hands of government, whether central or local. Clearly the more substantial debate is in the NHS about the outworking of commissioning and a mixed economy of public, private and charity sector including social enterprise. I mention all this as it was the main topic of discussion at the Surrey Voluntary Sector Chief Executives Group last Friday, at which widespread concerns were voiced about the commissioning /contracting process generally, and with particular examples across all services. This was not the sector being defensive, but an expression of deep concern about contract implementation, and impact on clients. I gave a presentation to the Rotary Club of Guildford District at lunchtime on Wednesday about the work of Surrey Youth Focus and its members, in return for my (very nice) roast pork and sticky toffee pudding. This has since prompted some useful follow up contacts. I also spoke to one Rotarian who has prostate cancer and is walking with two friends and a back – up support team the 1,000 miles from John 0’Groats to Land’s End to fund raise for an expanded urology unit at Guildford hospital. How wonderful! Meanwhile the group of young parents we are supporting to set up their own charity to support, train and advise new young (teenage) parents are themselves making good progress. So maybe this is the big society….just people getting on and making things happen…regardless. Enjoy Italy v. England but I am at the Old Vic in London watching Comedy of Errors. Have fun. Well, I have at last succumbed to the dreaded virus, and had a day’s sick leave on Monday, which is almost unprecedented in my 4 years here, and I feel very underpowered. Congratulations to Surrey Community Action for leading a successful Transforming Local Infrastructure bid and winning the maximum grant of £600,000. This will oil the wheels of a transformative change between SCA and the local Councils for Voluntary Services (CVS), and, in my view see them all morphing into a new single organisation. The Government (DCLG – Mr Pickles) announced a new £10 mill grant to a grouping of uniformed organisations enabling them to train up new volunteers and expand membership by 10,000. BUT NOT in Surrey. So I met with the Chairman of the Combined Cadet Forces and we discussed and agreed on the need to campaign and lobby for similar funding for all Surrey ’s successful uniformed organisations..so successful that they have huge waiting lists. I also had a very positive meeting with the businessman in Woking through whom we are setting up a social enterprise, and we now have new impetus, premises identified and the final legal documents being sorted out, and a start date. Though small in scale it does link two factors together- unemployment with job opportunity/enterprise for young people, and if we can make it work it can then be extended elsewhere. Incidentally, the Surrey youth unemployment figure has just increased slightly – to 2,960, but those out of work for more than 6 or 12 months are going up, so the business is much needed as it will specifically recruit and train unemployed young people. I hope my health will improve over the weekend…inspired by Scotland v. England rugby on Saturday….inspired by an England win of course, though they are definitely the underdogs this season.